The Fox's Weaver was formally described by Captain Claude Henry Baxter Grant, a British ornithologist and collector, and by Cyril Winthrop Mackworth-Praed, a British sport shooter & ornithologist. The Fox's Weaver was collected by Harold Munro Fox, an English zoologist. Grant and Mackworth-Praed originally listed the collector as TV Fox, but this is presumably an error, and Beolens 2003a listed the collector as Harold Munro Fox. Fox went to Naples, Italy, in 1912, where he worked on fertilisation at the Stazione Zoologica for ten months. In 1913 he was appointed lecturer in zoology at the Royal College of Science, London, by Ernest William MacBride. Presumably in this time he visited Uganda, where he collected 2 specimens of Fox's Weaver, a male on 30 July 1913 at Ngariam, and a female on 14 August 1913 at Usuku. Fox gave these specimens Stephenson Robert Clarke, who presented his own (and these) African specimens to the British Museum in 1923. 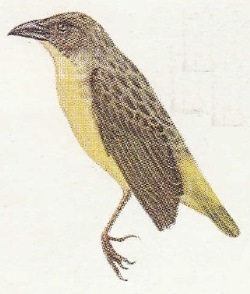 The Fox's Weaver specimens were overlooked until 1947 when Grant and Mackworth-Praed recognised this as a new species. The Fox's Weaver was first illustrated by Mackworth 1955a as a colour painting of a male and a female. Ploceus spekeoides	Grant and Mackworth-Praed (Grant 1947a), Bull. Br. Orn. Club 68 p.7,	Ngariam, Teso, Uganda. spekeoides, Greek: -oides, resembling; ie resembles Ploceus spekei (spekei - Named after Captain John Hanning Speke). 30 Jul 1913 and 14 Aug 1913. 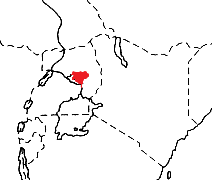 Ngariam, and Usuku, both in Teso, central Uganda. The types are in the British Museum (holotype BM_1923.8.7.2128). Identification. 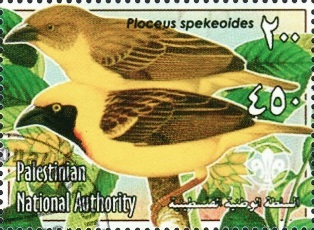 Fox's Weaver is a rare weaver with a heavy bill, short tail, and dark eye (the eye colour in the stamp is incorrect). The male has a reddish eye, yellow rump, and a black mask that ends in a point on the breast. Speke's Weaver is very similar but has a pale eye and its range is different. Heuglin's Masked Weaver has a small bill, pale eye, and plain green back. The Vitelline Masked Weaver has a chestnut crown, and a black mask that is rounded on the throat. 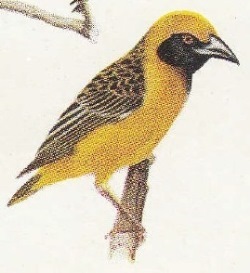 The Lesser Masked Weaver has a white eye and black forecrown. The female Fox's Weaver is dull, with yellow rump and underparts, and with heavy dark steaks on the crown and back. Distribution. 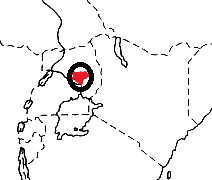 Fox's Weaver is found in central Uganda (see map below, based on Birds of Africa). It has been recorded at, and around, Lakes Bisina and Opeta; at Rhino Camp (in Arua) and around Lake Kyoga (near Nakasongola). Fox's Weaver was first collected at Nariam Swamp, but this wetland has since been drained. Every year during the Oct-Feb dry season, large numbers of cattle move to the Opeta region for grazing, which degrades the wooded grassland on which this weaver depends for breeding. Fox's Weaver is considered Near-threatened as it has a restricted range and is very poorly known. Habitat. Fox's Weaver inhabits bushed and wooded grassland in swampy areas, but in the dry season it seems to leave the breeding sites. Food. The Fox's Weaver feeds on seeds, and probably on insects. Breeding. The Fox's Weaver is apparently colonial. The nest is oval, roughly woven and without an entrance tunnel. It nests in swamps. In 1996, 47 nests were counted around Lake Bisina. There is no other information on eggs or breeding.